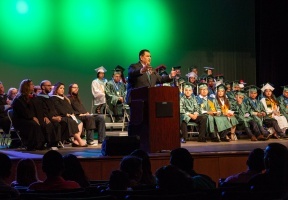 Senator Martin A. Sandoval (D-Chicago) began his 2018 graduation speaking tour last week by addressing several graduating classes and a civics organization. “I think a lot of the problem with the political discourse today is that legislators aren’t accessible to the public,” Sandoval said. “I consider accessibility one of the most important facets of my job and speaking arrangements like these help me keep in tune to the needs of my constituents.” Sandoval started the tour with a brief State of the State address to the Clearing Civic League at Hale Park on the Southwest Side of Chicago. He has also addressed graduating classes from Enrico Tonti Elementary School, World Language Academy High School, Irene C. Hernandez Middle School, Latino Youth High School, Calmeca Academy of Fine Arts and Dual Language, Nathan S Davis Elementary, Francisco I Madero Middle School, Multicultural Academy of Scholarship and Socorro Sandoval Elementary School.